A hundred years ago… on December 25, 1914, as much discussed of late, the Western Front went relatively quiet and some British, French and German troops even fraternised with the enemy, singing carols, playing football and chatting together in No Man’s Land. But over in the east a section of the Ottoman Army, fighting the Battle of Sarikamish, which began on December 22 in the Caucasus mountains, marched for 14 hours in heavy snow – towards a crushing and relentless defeat by the Russian Army eventually concluded on January 17 (32,000 Ottoman troops killed in action, another 15,000 dead from illness, mainly induced by frostbite; 28,000 Russians dead one way or the other). Despite their officers in the 2/1st City Of London Battalion, Royal Fusiliers, overlooking their men’s fervent desire to see their families, as described in last week’s blog the soldiery protested to the brink of mutiny, their complaints were received and understood and a thousand men got the couple of days’ leave they craved. ‘With money in their pockets, the brothers bought a turkey in the market place along with fruit, sweets… and Turkish cigarettes, probably costing 4d* for ten instead of the usual 2d for English — their rich aroma seemed to lend an air of opulence to that small home. So they all settled down to spend a really happy Christmas together. This might be the last family gathering for several years and, for once, all of them did their utmost to make the occasion memorable — starting that night with the collective manufacture of decorative chains from strips of coloured paper and flour paste. A gay touch in the living room. Mother spent much time at the coal-fired cooking range. It took skill to stoke it and arrange the dampers so that pots of vegetables on top kept boiling while the bird and stuffing in the oven roasted without burning. Pa had bought a bottle of cheap claret, a favourite of mother’s though, to put it mildly, a bit sharp for the tastes of the youngsters. But all protested that they liked it. Drinking some fizzy mineral water, of which they’d bought several large bottles — “penny monsters” — soon softened its harshness. What with playing games, telling yarns about Army experiences, and resting between unusually large meals, the hours passed quickly. They all praised Ma’s cooking and even Dad put aside the load of worry which always appeared to be crushing him… and smiled occasionally. The war was hardly mentioned, although this Christmas should have marked the end of hostilities according to many forecasters. Everyone knew it was not going well, and flickers of fear disturbed even reasonably optimistic people. 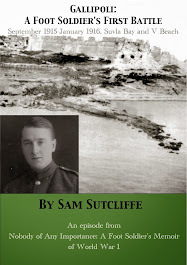 A hundred years ago… at home fear and bitterness probably reached a new peak in the North after the December 16 German Naval raid made “Remember Scarborough!” a key recruiting slogan for a while (although Hartlepool suffered the majority of the 592 casualties). On the Western Front, the new yet already perceived by some on both sides as interminable slog of trench warfare proceeded most intensely in The First Battle Of Champagne, mainly carried by the French Army. But, of course, the event of the week was the Christmas Truce, 100,000 men, British, German, French, downing weapons to sing, talk, exchange souvenirs, play football in some fashion – just stop. This morning (Dec 20, 2014) I heard Jon Snow on the radio saying, if TV news cameras had been there and the whole world seen the footage within hours, the war would have had to end there and then... it’s quite a thought, though easy enough to pick holes in given the way highly scrutinised modern wars continue (see my father’s summation of his experience which sits at the top of every page of this blog, through to the Peace Parade Centenary in July, 2019). 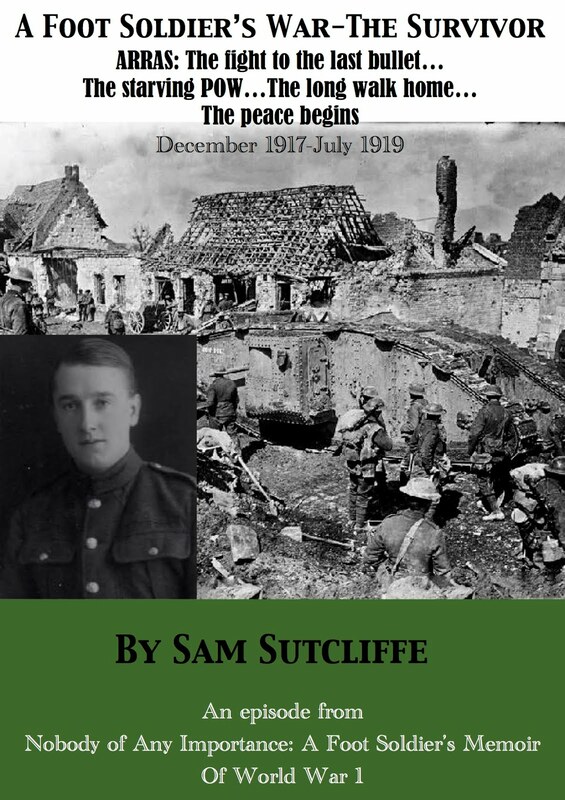 ‘As Christmas 1914 approached, and it appeared likely the Battalion would remain in England during the holiday, the chaps began to speculate about whether they would be allowed home. “They’re sure to grant two or three days leave,” was the general opinion. So, warming anticipation of reunions with families gave rise to a happiness which permeated all the men. Officers must have noticed the prevailing joyfulness but, perhaps, did not realise what caused it. An announcement that Christmas Eve would be free of parades and work contained no reference to leave of absence. Puzzlement and doubt replaced anticipatory elation. Then, as groups of men discussed the strange silence about Christmas plans, anger caused some men to threaten to go home without permission. “But that would be a crime, either desertion with trial by court martial or else a charge of being absent without leave” — so cautious men told the impatient ones. It developed into a serious situation; on the morning of Christmas Eve, no guidance having come from above, a large number of men gathered on the London platform at the railway station. They had bought their tickets and were now committing their threatened breach of military discipline. But somebody had informed the RSM about the looming exodus and his powerful voice could be heard ordering all men to return to their billets. Most anxious not to provide authority with any excuse for questioning his stated age and discharging him, Tommy had not made a decision about joining this rebellion. He had found a position outside the station from which he observed the following scene, and even heard much of what was said. He saw no general movement by the, shall we say, insurgents to leave the platform and, quite suddenly, the booming voice of the RSM fell silent. All faces turned towards the station entrance. The Colonel marched in with a substantial group of officers, followed by porters carrying a large number of bags. The party stopped abruptly at the sight of the assembled troops. The Colonel’s face expressed great surprise, as Tommy could clearly see. Then he turned to confer with Captain Blunt, his adjutant. Other officers moved in closer and there was much quiet discussion. Some Privates standing nearby were called forward and, like good soldiers, all saluted correctly together, straight and upright, eyes looking straight ahead and not at the officers asking the questions. They may have contemplated doing a bunk, thought Tommy, but they had remembered their training. Soon the men saluted, turned about and rejoined their comrades. Then the Colonel came forward and addressed the men. A terrific cheer followed his speech so Tommy readily guessed its import. He climbed down from his perch, passed through an open gate on into the station coal depot and crossed several railway lines till he came to iron railings and called to men on the platform, asking for information. He learnt that the amateur officers had made their first major blunder. They had taken no thought of what was to happen to their men during the Christmas festivities. Vaguely, they had assumed that the rank and file would remain mostly in their billets and take meals with the families. 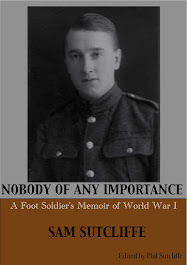 For a start, this rather haughtily assumed that those families would or could supply Christmas fare for comparative strangers and also took for granted that the soldiers would wish to remain in billets in such awkward circumstances. Yet the officers themselves had no doubt as to where they were going to spend the holiday. Of course, not all the men had gathered at the railway station, so volunteers offered to go to each CSM and pass on the good news: two-day leave had been granted to all. Thus, the remainder of the men would travel to town by the next train — as Tommy resolved to do. A hundred years ago… the “Winter Operations” on the Western Front ground on with fresh battles beginning at Artois (December 17th), Givenchy (18th) and Champagne (20th – a thwarted French attack leading to casualties over the following three months reckoned by two different recent accounts to be either 93,000 or 240,000; the fog of war lingering still?). To the East, the Russians conceded to the Austro-Hungarians at Limanowa (13th) and the Austro-Hungarians backed down against the Serbs at the Kolubara River (16th), while in Egypt the British simply declared the country their Protectorate (18th). But the week’s most alarming event for the British people erupted on the morning of the 16th, a Wednesday, when a squadron of German warships sailed up to the Durham and Yorkshire coast to bombard Hartlepool, Whitby and Scarborough. At Hartlepool, their main target because of the naval dockyard, they fired 1,150 shells in maybe 50 minutes, damaging a steelworks and the railway too and killing 117 people, mostly civilians. A Private Theophilus Jones became the war’s first military casualty on British soil. However, the Government chose “Remember Scarborough” as the resultant recruitment slogan, perhaps thinking to trade on the notion of violated seaside innocence. 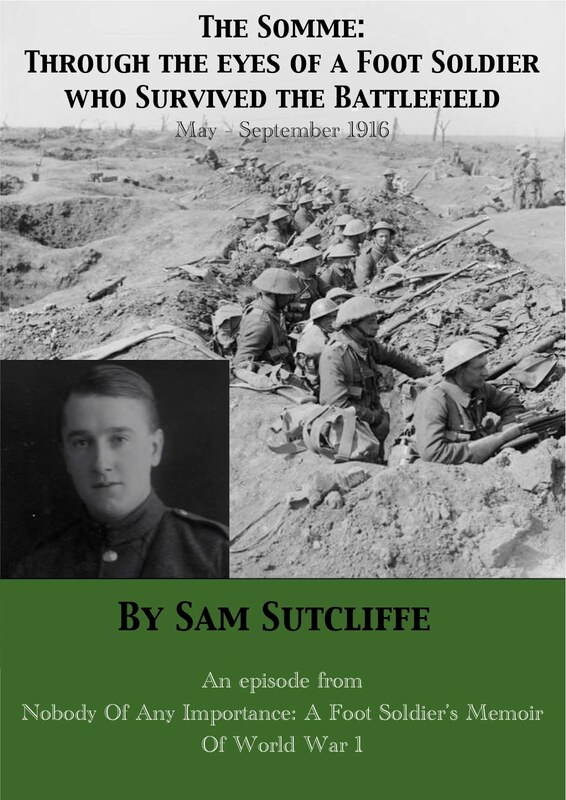 Meanwhile, down in Kent, under-age volunteer Sam Sutcliffe, 16, his brother Ted, 18, and their 1,000 comrades in the 2/1st City Of London Battalion, Royal Fusiliers, most of them from working-class and/or poor homes – like my father’s in Edmonton – enjoyed some home-from-home comforts, courtesy of the Army’s decision to keep them away from the Front for an ever-extending “time being”... partly, of course, because they couldn’t supply the lads with rifles as yet! ‘Came the Monday morning, the air clear and pleasantly chilly. Tommy and Churniston expressed their surprise and delight when Mrs F laid out the food she had prepared for their first day’s digging. She had wrapped fine, white, table napkins round large, meat pasties, marmalade turnovers and lots of sandwiches. Wonderful food, lovingly prepared and packed. Each of the boys had sufficient for four men and, although they thanked her sincerely, Tommy certainly felt he had not done justice to the kindness shown to him — at that age, boys are often tongue-tied if there is emotion present. He hoped Mrs F would make allowances. ‘... at the station, when the troops opened the carriage doors, laughs and curses filled the air. Cattle trucks, pigsties, travelling chicken sheds, were among the popular names for the compartments. Very old, small in all dimensions, they had bare boards for seats and partitions. The question arose, who had used them before? Hop-pickers came the answer — seasonal migrants, mostly from the city, who worked hard during the few weeks of the harvest. Because they were poor people the railway company had gone to the trouble of constructing this shabby transport for them. No doubt the workers paid special low fares to travel to their low-paid work, therefore their bottoms were not to be cushioned nor their heads to rest on upholstery.